Rose Coschignano/Staff Photographer Powerful United Ladies Striving to Elevate (P.U.L.S.E.) hosts its eighth annual leadership conference to celebrate female entrepreneurs of color. 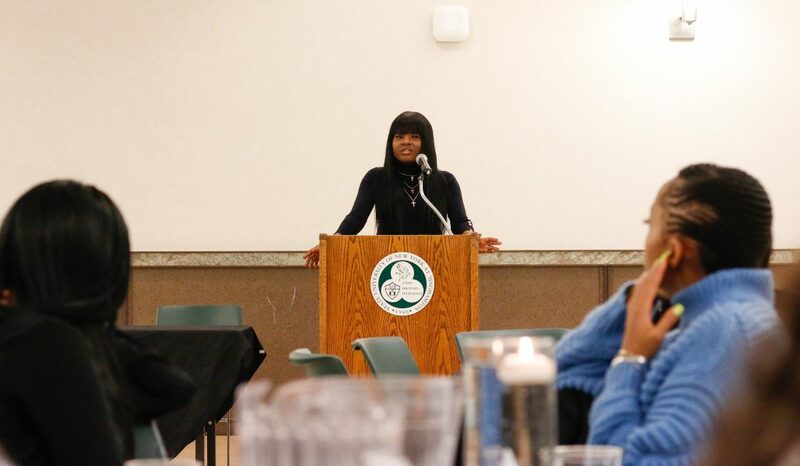 The conference, held on Friday and organized entirely by P.U.L.S.E.’s Executive Board, featured speeches from female entrepreneurs such as Kelcy Hercules, who runs a nonprofit organization called Blossom Be You Project, and Fabiola Jean, a broadcast journalist who runs a nonprofit organization called the Propelled Media Mentorship Program. It also hosted a number of student panelists, including Susan Obatola, an undeclared sophomore, Jada Greene, a junior majoring in graphic design and Danielle Christian, a senior majoring in business administration, all of whom run businesses at Binghamton University. P.U.L.S.E., which started in 2007, was created to promote professional and personal empowerment for women of color on campus. The leadership conference is one of its largest events of the year. According to Jennifer Tiburcio, president of P.U.L.S.E. and a junior majoring in political science, this year’s conference aimed to be more interactive and encourage networking. Shermila Maitland, vice president of P.U.L.S.E. and a senior majoring in human development, said centering the dinner around empowerment made it less formal and showed attendees they shouldn’t be apprehensive when it comes to striving for their goals. “I wanted our audience to know that they don’t have to necessarily wait in order to start capitalizing on their talents,” Maitland said. Hercules, who started Blossom Be You Project, a nonprofit organization in Brooklyn, New York that aims to empower young women of color in underserved communities, spoke about her experiences as a woman of color and an entrepreneur. “In a predominantly white middle school, I was constantly picked on about my skin color, my height, my oversized features and my diction, so I didn’t understand why I was different, and I started to try manipulating my features so that I could fit in with the white students at my school,” Hercules said. Those experiences inspired Hercules to build her own organization. At Blossom Be You Project, young women focus on learning about career paths and education options, understanding how to address challenges they may face in their schools or workplaces and receiving guidance about how to foster healthy relationships with their peers and adults. Jean, the founder of the Propelled Media Mentorship Program, also works with young women. During her keynote speech, Jean discussed her nonprofit, which aims to mentor Caribbean and African American women between the ages of 16 and 21 through multimedia platforms and entertainment. The event also featured a group of student panelists who run their own businesses on campus. Obatola, who created Adunni Angel Extensions, a business that sells eyelash extensions and hair bundles, said feeling supported is crucial to being a successful entrepreneur. Greene, who started her own beauty businesses for hair and eyelashes called “Jadadidmyhair” and ”Jadadidmyminks” on Instagram, said the hardest part about starting a business as a student is maintaining a work-life balance. ”The main struggle is having to balance classes, relationships and just staying sane in college, along with making money, doing my own business [and] taking clients,” Greene said. Kelsey Bobb, a senior majoring in integrative neuroscience, said she was inspired by the leadership conference. According to Bobb, P.U.L.S.E. reminds her there are other women on campus who share common backgrounds and experiences. “I feel like this is one of the organizations on campus, especially for colored women, to come together and feel unity and know that we’re in this together,” Bobb said.